The kind of urgent care Burbank residents can expect in their fair city is often not the best available, with packed waiting rooms and rushed doctors who only see the patient for about 15 minutes. Fortunately, there is a new type of urgent care in Burbank, found with House Call Doctor Los Angeles. House call doctors are not just a relic of years past, because they are still around in the 21st century, and gaining more and more attention for their more thorough care. This can even be said for patients who need a 24 hour doctor, where they don't want to leave the comfort and security of their own home. House Call Doctor Los Angeles' President and primary care provider is Dr. Michael Farzam, a board-certified internist who provides the kind of urgent care Burbank needs, even if it's in the middle of the night on a weekend or holiday. 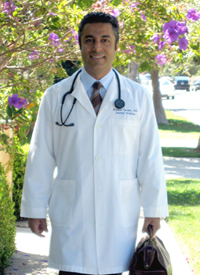 Dr. Farzam is available throughout the Greater Los Angeles area, from Huntington Beach to Valencia and beyond. Urgent care in Burbank need not mean a trip to a crowded waiting room filled with contagions and germs, and being subject to getting even sicker. 24 hour urgent care in Burbank doesn't have to mean leaving your home. Call House Call Doctor Los Angeles today to learn more about how you can be attended to in your own home, and the difference a house call doctor can make to get you feeling back to one-hundred percent again! Fee schedules are available when you call. Please call today to learn more at 310-849-7991.